This is another thing that I've wanted to sort out for the kids for a while, but it wasn't until recently that the right container came our way. One of our friends had a painting restored, and it came in a nice sturdy wooden crate. He was going to ditch the crate, so we nabbed it (thanks Rich!). It's been in use in our livingroom for a while as a Lego construction center. It contains all the teensy bits of Lego and stops them spreading all over the livingroom. We used to use a blanket, but this is much better. 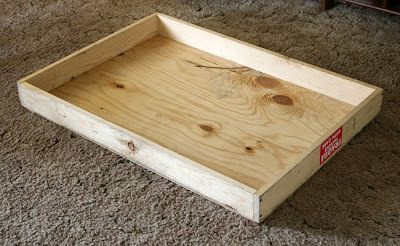 I have seen a couple of lightboxes come up on Craigslist, the last one was even free, but it was too big for us to transport, and so I decided to use this crate base to make our own, but make it so that it could be stored away, and used both inside and outside, whilst still being able to be used with the Lego when we wanted. 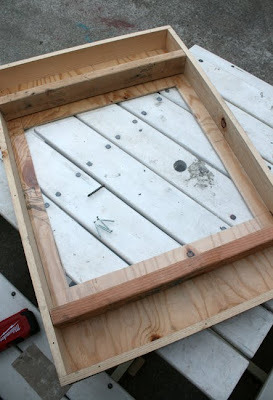 All I needed to do was a bit of measuring, then jigsaw out a nice big hole from the base, cut some plexiglass to size, and then screw in a couple of lengths of 2x4 to hold the plexiglass down. This also resulted in a couple of nice sized sections on either side of the screen that could hold supplies. I need to say thank you to a lovely reader Liz, who emailed me to tell me about an architectural salvage place near us that might be able to give away some gnarly 2x4 for the kids to hammer at. Thank you Liz! The two bits of 2x4 I used for this were from there! 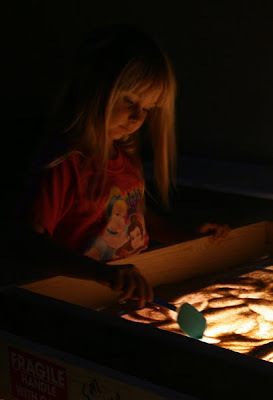 To use this outside with the sand, I just propped it up on four of our giant wooden blocks, and put a couple of desk lamps under the table with an extension chord. 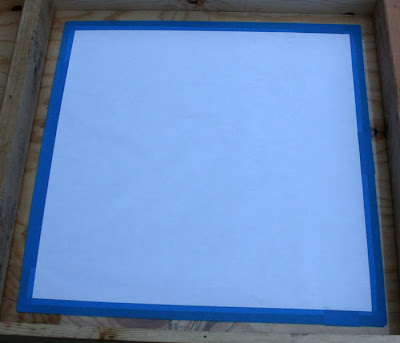 Then I used painters tape to tape a sheet of white paper over the plexiglass, to make a light diffuser that would also protect the plexiglass from scratching in case we want to use it for something else in the future. I also dug out some little glass nuggets to add interest to the set up. 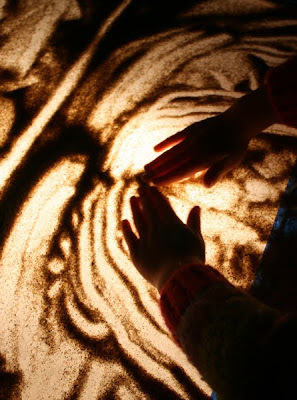 There are loads of sand art videos you can watch on the web. I showed my kids a few before we went out to play with ours, so they knew what we were making. 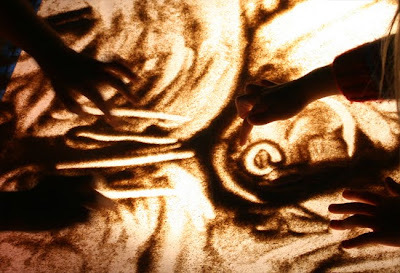 This sand animation by Kseniya Simonova in my opinion is by far the best one I've seen. It's not the easiest to explain to young children, because it's about the Nazi invasion of the USSR during the second world war, but it's very powerfully done. 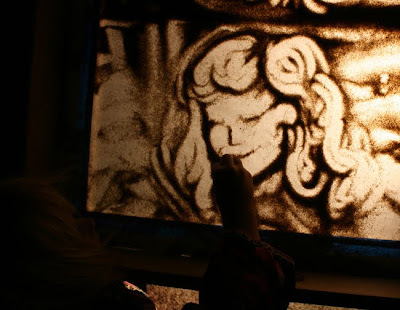 There are plenty of other examples of sand art/animation on Youtube that are much easier for kids to watch if you think this particular one is a bit too heavy to explain. 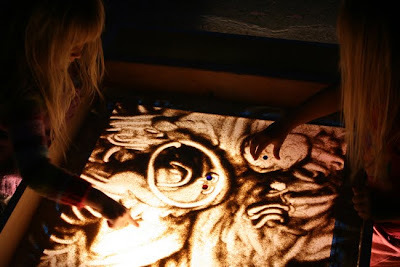 The kids were very excited to go out in the dark to play with the sand lightbox. We had to wait until about 9pm for it to be dark enough, but it was worth the late night for the kids because they had so much fun with it! I gave them a couple of rubber spatulas to work the sand with as well as their hands. The sand we used was right out of our sandbox, so it was quite course. I'd like to try and find a tub of fine grained sand to make more detail possible in our drawings, but there's plenty of time for that. 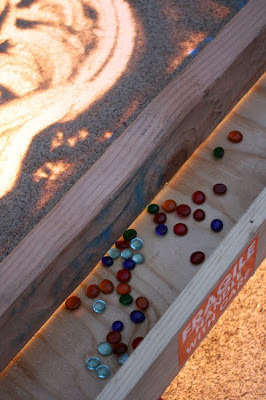 It only took a couple of cups of sand, and all the sand was nicely contained by the box's 4 inch sides. Gradually I'm hoping that the kids can start to use this as a medium for telling stories and I can video a few. Of course I couldn't resist having a go too. The girls wanted me to draw a lady so that they could use the glass nuggets as her necklace. I have another post for you coming up on how we used this set up indoors too. This is wonderful! We may have to try this soon. That is so very neat! You are so talented! Well that is just incredible. Anything involving cutting wood and hammering nails is too involved for me, but I'll try to think of something to make our own. It's just too cool not to try! Erg! We actually own a proper light box that I picked up for $10 at a rummage sale, but it's been jostled around to the point that one of the florescent fixtures has gotten so finicky that it isn't worth the effort. We've moved on to playing with an old overhead projector and an old opaque projector, but this has motivated me to get the thing fixed. Several years ago someone was using this art form in their TV commercials (it might have been Simonova) and I found it so beautiful. 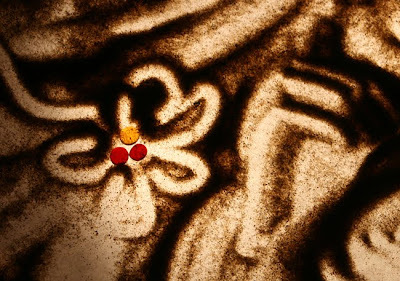 Your sand artwork is every bit as pretty. I'm particularly fond of your idea of protecting the plexiglass. You do know that you're the best mom ever right?! Very ultra cool as usual! When I first saw this, I thought it was going to be really complicated...but once again you have made a really cool item from simple materials. So clever!! Fab idea! Way better than finger painting. & FWIW, table salt is cheap & clean & fine-grained & a great substitute for sand. I use it a lot for art & crafts 'sand art' projects. 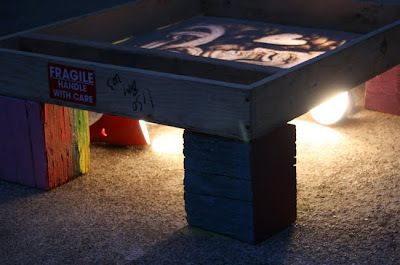 We've done this for several years with a traditional light table. 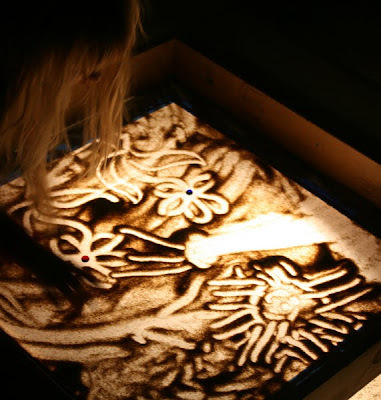 The sand (black craft sand) is in a large flat clear plastic box that's placed on top of the light table. 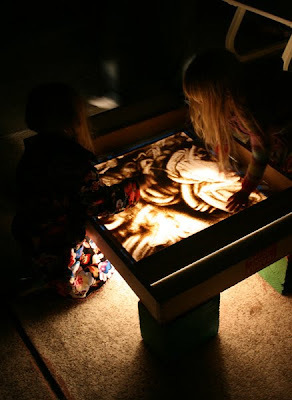 With your set-up, it would be easy to change the lights, something I've always wanted to do, but the pricey light table belongs to the preschool I work at. What would their art look like if the desk lamps had red bulbs in them or if the light source were a string of multi-colored Christmas lights? If you try it, please post photos. I linked to you today. You have such great preschool ideas. thanks! oh how georgous is this! your blog is such a spring of ideas - unbelieveable! Have you got my mail - I really, really would appreciate it to have one of your project in my magazine and introduce it to the germanspeaking world! coolest idea! thanks for the inspiration. Very inspiring post! Thank you! 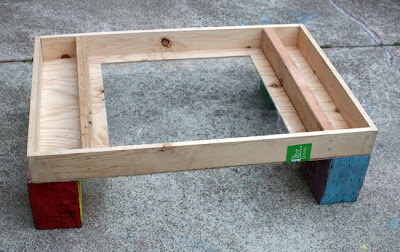 Oh this looks so much easier to make than all the other DIY tutorials. Can't wait to get mine built for my ladies. This is truly amazing and wonderful craft! Thank you for sharing this. Awesome and perfect for the kids. We also did a Sensory Texture Crayon Rubbings Art out of the same materials you used. You should check this out! My 6-year old nephew absolutely loves playing in sand. So much so, that for xmas he got a new texture sand that helps with his sensory issues because it holds together better, he can play with it inside. Great stuff. And this idea of yours is another facet for him to enjoy his favorite pastime...other than video games. Thank you for giving me something he can actively and creatively DO with a natural substance to help him enjoy his truly favorite pastime.